Well, it looks like I am going to completely miss my stated goal of finishing blogging our honeymoon before we jet off to Florence. It's a good thing I'm not getting graded on this, yes? On an unrelated note, we went to Cool River Cafe last night because we got a random certificate in our mail for $25 off food. (Huh! I didn't know it was a chain! Well, that certainly explains a lot.) Our conclusion? Eh. They did have a really nice wine list; we got a reasonably priced viognier/chenin blanc from these guys, which went well with our giant deep dish spinach/artichoke dip, seared tuna (me) with wasabi/jicama slaw and mango sticky rice, and salad with pecans, blue cheese, and pears (husbear). Maybe we didn't give them a fair chance, since we didn't get any steaks, but the food was just ok. The place was huge, though! We went over into the bar after we ate, thinking we might get an after-dinner drink, but the place had a coverband singing "brick house", "car wash" along with many other 70s specialties, booty-dancing 30somethings, and an oddly Disney vibe, so we left. They did make the Husbear a great negroni, though. Anyway, back to the honeymoon. 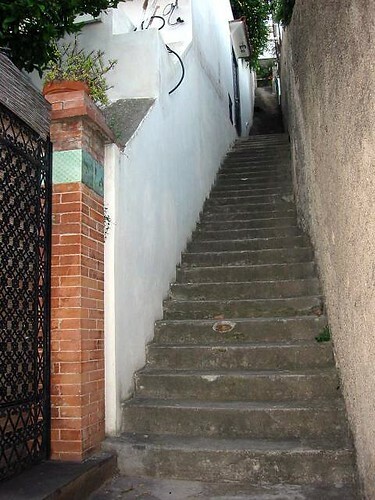 Tuesday, I woke up with my calves just aching - those stairs were really coming back to bite me. 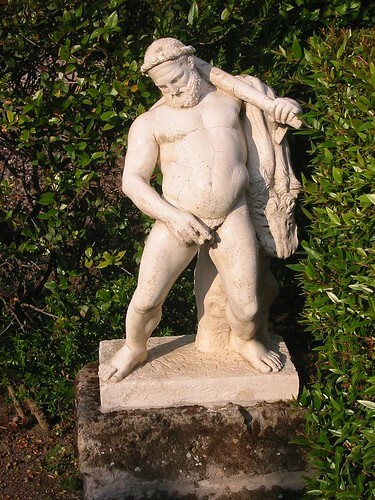 I tried to hobble around for a little while, but it just wasn't working for me. We decided to get a later start, hoping I would be able to walk. 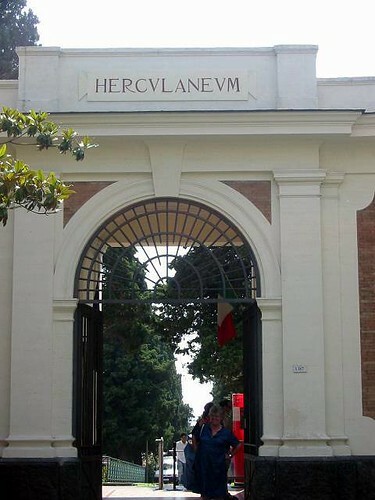 We ended up leaving in the late morning for Herculaneum. Husbear figured that this would mean less walking than Pompeii, since it's supposed to be a smaller site, plus we both agreed that just laying there probably wouldn't help my calves any. We walked to the top of the town and waited for the bus. 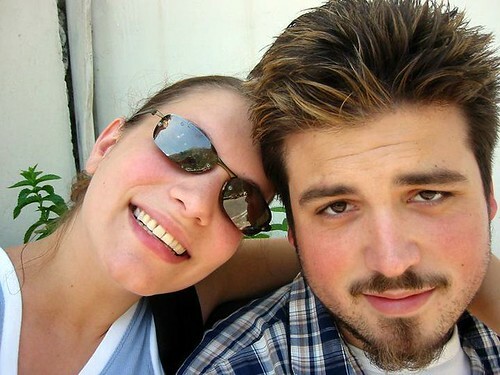 I took a few pictures of us to while away the time while we waited. It didn't take too long to get there. (maybe an hour?) When we arrived, we found a little pizza place for a late lunch, and I got a pizza with marinara sauce and anchovies. Stupidly, no pictures. I still remember that smell, though. 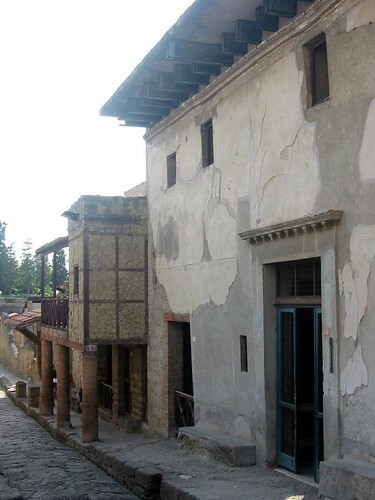 Ercolano was pretty nondescript; not a lot of history evident in the walk from the station to the ruins. Lots of graffiti, though. Anyway, here's the gate to get into the ruins. This was the first glimpse we had of the site, after paying at the gate. You can see modern Ercolano in the distance. It's pretty amazing how well-preserved a lot of the site was, after almost 2000 years; even from this distance, you can see little bits of the frescoes and murals on the walls of the buildings. 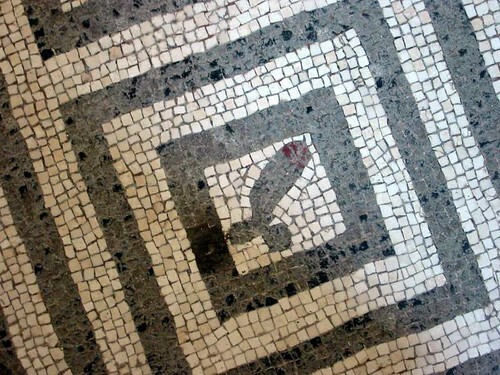 There were some funny off-color mosaics in the ladies' baths; many of the same kind of things we saw in the restricted room in the Archaeological Museum in Naples. Someone (or a group of someones) really spent a lot of time on that mosaic! The pattern covered the floor of a very large room. 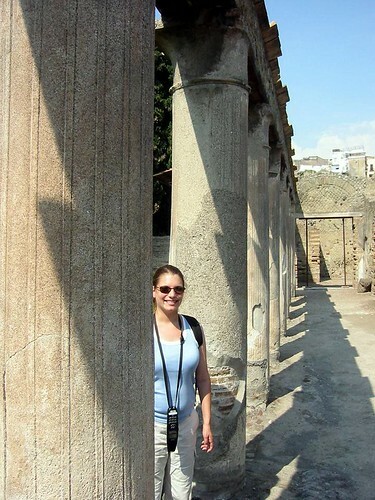 You could really easily see a lot about the day-to-day lives of the Romans on the streets of Herculaneum. There were wagon ruts in the roads. We saw the remains of several food stands, and I made Husbear pose at one of them. 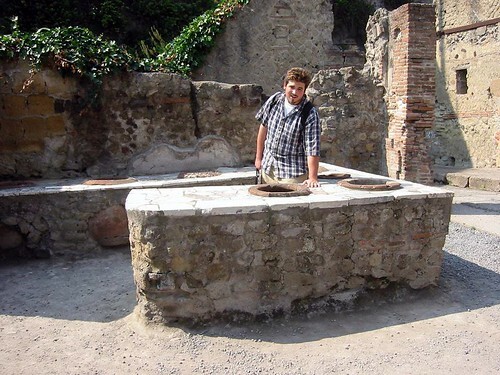 Apparently, the citizens of Herculaneum often ate lunch away from home, and would stop at these vendors. Those are very large pots bricked into the counter, from which lunch would be dished up. Interesting. All told, we were at the site for about 4 hours... 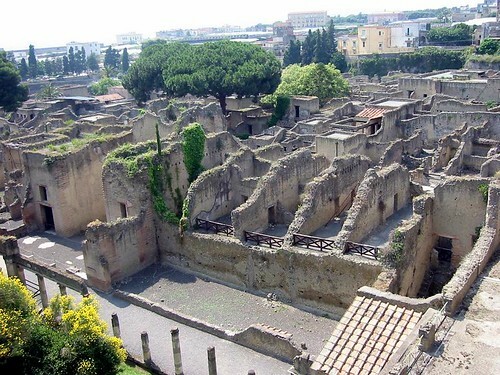 If Herculaneum's really so much smaller than Pompeii, I can't imagine how long it would take to go through that town! As it was, we didn't listen to good chunks of the audio tour. Pompeii must be enormous. We headed back to Positano via train/bus. My calves were actually feeling a little better, which was a good thing, because after we got back and picked up some things for dinner, it was once again time to climb these. This was the last strech of stairs on the way back to our little house. By Tuesday, we actually were starting to get a little more acclimated to them, in that we didn't have to collapse each time we walked into the house. 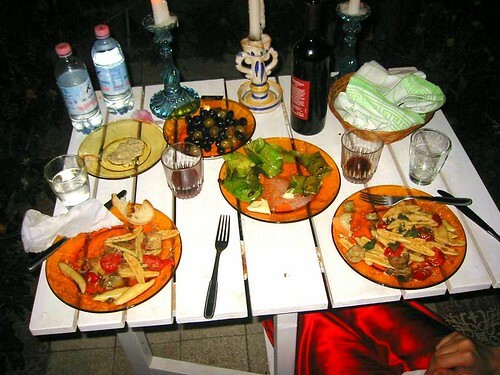 Husbear made a really great dinner, which we ate on our porch.